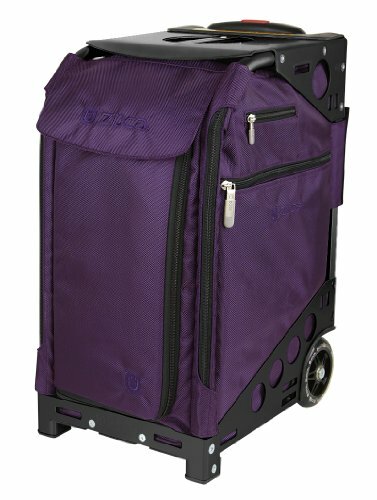 The Zuca Pro Artist Royal Purple Insert Bag on Black Frame features an aluminum alloy frame, which is light, but super strong, and will safely support 300 lbs. The Sport Insert Bag is removable, hand-washable, and is made from premium water-resistant 600D polyester. The 4 lightweight polyurthane wheels absorb shock, and provide a silent ride. Includes a 41 telescoping handle and a gear platform to carry additional loads. The Zuca Pro is part carry-on, part organizer and part darn is this thing cool, and comes with a built in seat. The Zuca Pro Artist Royal Purple Insert Bag on Black Frame features an aluminum alloy frame, which is light, but super strong, and will safely support 300 lbs. The 4" lightweight polyurthane wheels absorb shock, and provide a silent ride. Includes a 41" telescoping handle and a gear platform to carry additional loads. The Zuca Pro is part carry-on, part organizer and part "darn is this thing cool", and comes with a built in seat.